The rail operator running the Cotswold Line must improve local decision making to focus on county passenger needs following a public consultation on the company’s performance. Rail Minister Jo Johnson has written to West Worcestershire MP Harriett Baldwin confirming the new requirements which have also been published in the Government’s response to the consultation on the future of the Great Western railway franchise. And although the Minister ruled out splitting the franchise, he confirmed that there is scope in the longer term to re-examine franchise boundaries. 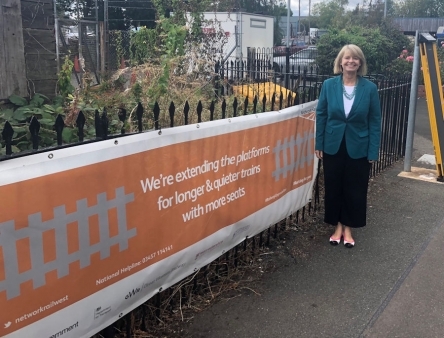 Harriett has been involved in a lengthy dialogue with the Department for Transport and rail operators to re-assess the Cotswold Line and to improve investment in the busy rail commuter route. Harriett commented: “I have been concerned that over recent years, the current franchise holder has neglected its commitments to the Cotswold Line, promised as part of its franchise renewal in 2015. “I am pleased that the Department for Transport has acknowledged this issue and is insisting that the rail operator should improve its focus on delivering what local passengers want. “We all want to see faster, more frequent, more reliable services for county commuters and I hope that this will lead to an improved level of attention by Great Western Railways. “I’m also pleased that the Department is willing to look in the longer term at re-drawing the franchise boundaries and hopefully allowing us to move the line into a new franchise agreement. “There is some good news with the recent commitment to build a longer platform at Pershore and train companies agreeing to stop at the new Worcestershire Parkway station but we are all eager to see improved performance for regular rail commuters to and from the county.